Time to finish off this review! Check back here for a review of the ground floor (pool hall and barber shop), and the detective’s office. For the rest, read on! Over in the bathroom, it’s pretty standard. Interesting parts include the toilet seat and bowl, toilet door, and the plant and bowl out the front of the office door. One part that sits outside the bathroom is the black paint roller. They’re unique to the set, and you get 2! I’ve always wanted these, so I’m pretty happy. It’s only ever been seen in the Series 10 Collectible Minifigures’ Decorator. It’s a shame there isn’t a spare. They are used for the lights above the Barber shop sign, and they look really classy. Much better than using a tap instead. One of the most intriguing parts of the set is the 1×1 round plate with hole. Although these are in other sets, it’s the first time they’re in black, and with 17 in this set, you’re loaded with them. They’re used in the lamps as well. I really like the toilet, with it’s tall cistern and pull chain, and I love the little basin created out of a 1×1 wall corner. I was wondering what that part was for. Once I added the tap, I realised. It looks great! Such a small section of the build, but really interesting. It would have been good to see the bathroom take up a little more space. There’s a little wasted space in that area now, and while it makes a fantastic addition to the set, it could have been extended a bit more, with a bigger sink. Maybe that’s something I’ll mod when I get round to it. Finally, there’s the drop down ladder. I didn’t even realise it was there, and got very confused when I was putting it together. It’s a great little addition, and while it doesn’t quite reach the floor, it looks really effective. The only other thing I have noticed with this area is that there’s no way for the balcony to be accessed without climbing out the window. Sure, it looks good and adds some more detail to the building, but it didn’t make sense. 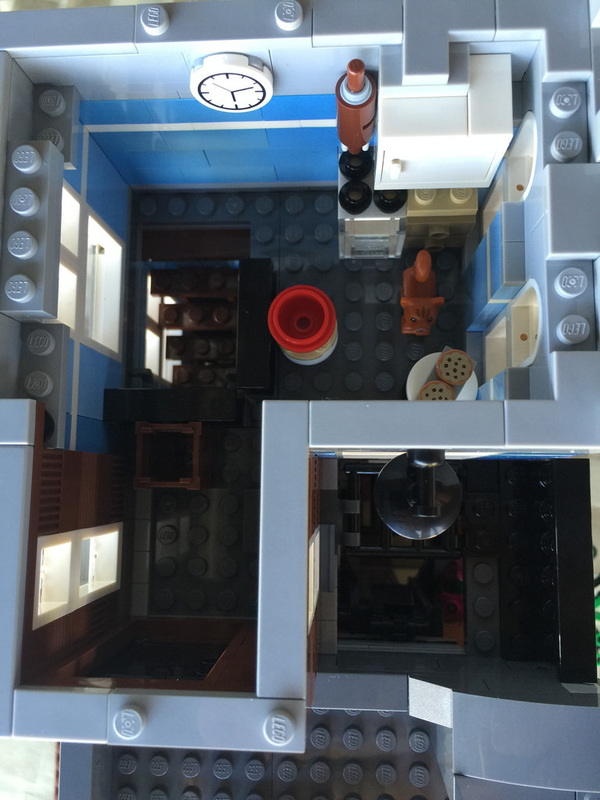 At the top floor you’ll find a kitchen (the source of the contraband cookies), and a rooftop terrace area. The kitchen area contains some pretty standard parts, but a few are noteworthy. There’s another of the white tabletops I mentioned in last week’s post, as well as four of the 1×1 plates with round holes used as hotplates on the oven. There’s also a cat and a very cleverly put together rolling pin. I was pretty chuffed with the cat though. I’ve never had a cat in a set before, so this was a great inclusion. In the kitchen are some arched window frames. They look good as a feature, but don’t have any windows in them. 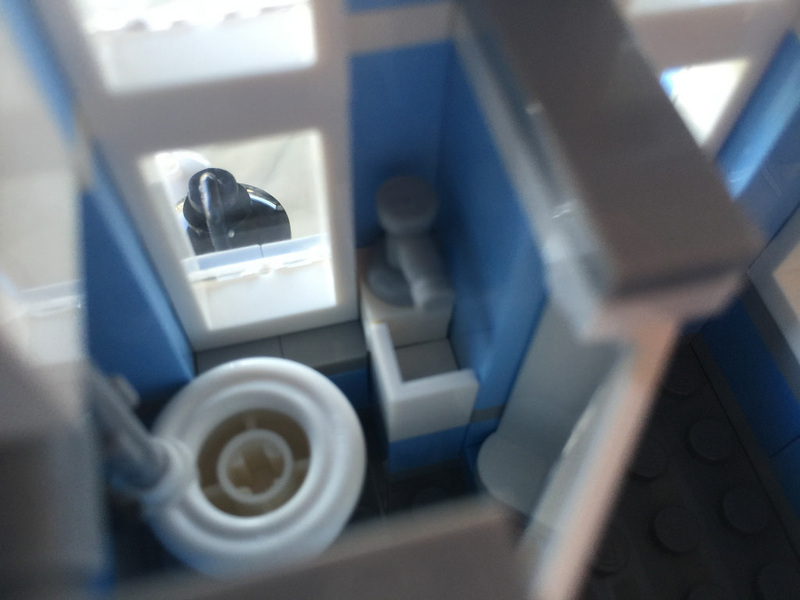 In all fairness, I don’t think LEGO produces glass for that type of frame, but it would have been a great inclusion. I know it’s not really all that unique, but there’s also a nice 2×2 round clock tile included. The rooftop areas have some really great looking parts, two of which are unique to the set. Before I mention those, let’s look at the water tower. It cleverly uses a bunch of linked caterpillar tracks to get the curve right. It looks fantastic, and it’s good to know they fit nicely into the underside of 1×3 tiles! 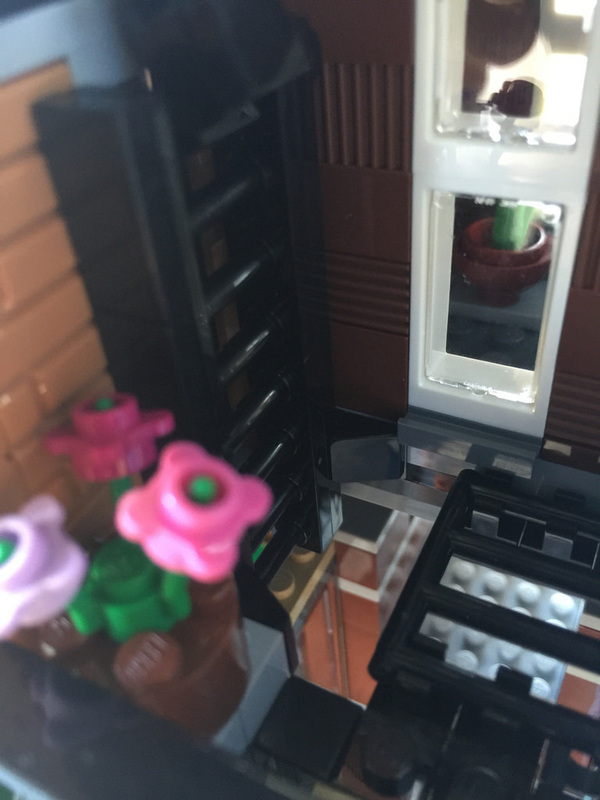 The roof detailing uses a couple of parts that have been recoloured for this set, namely a series of Hero Factory fists, and Unikitty’s tail. They’re recoloured in Dark Stone Grey, and in the case of Unikitty’s tail, they are added to the building using 2 of my favourite part, the Erling Brick. For those of you that aren’t sure what the deal is with this brick, check out this page dedicated to it. 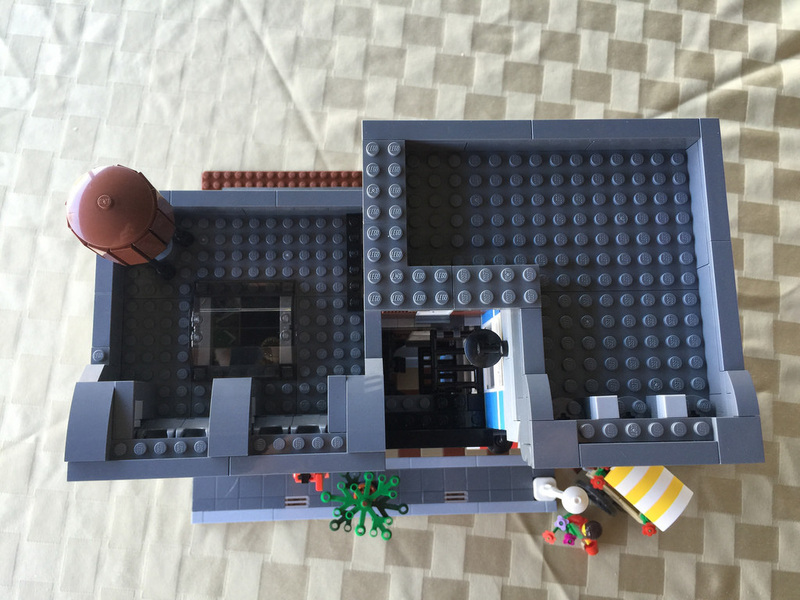 It was designed by legendary LEGO designer Erling Dideriksen in 1979, and is one of the most important bricks in LEGO. The last two parts I want to mention specifically are on the POOL sign. These are, once again, unique to the set, and you get a good amount of them. One is the flat tile corner 1x2x2, and the other is the flat tile 2×2 round with hole. These look really great in bright red, and the sign is fantastic to build. The sign itself is double sided, and comes together very neatly, in a way I’ve never seen before (don’t worry, I won’t spoil it for you). I like the crooked approach to the P and L. It looks more authentic. It’s the one part that always gets pulled off my set and investigated more closely, followed by a response of “that’s really cool. I didn’t realise you could do that with LEGO!”. Down at street level is a nice little newspaper dispenser, a very strange looking tree, a bench seat out the front of the barber shop, and a lamppost. I really like the look of the bench seat, and the lamppost is one that can be replaced with an LED version from LiteUpBlocks, a site I’ve mentioned before. 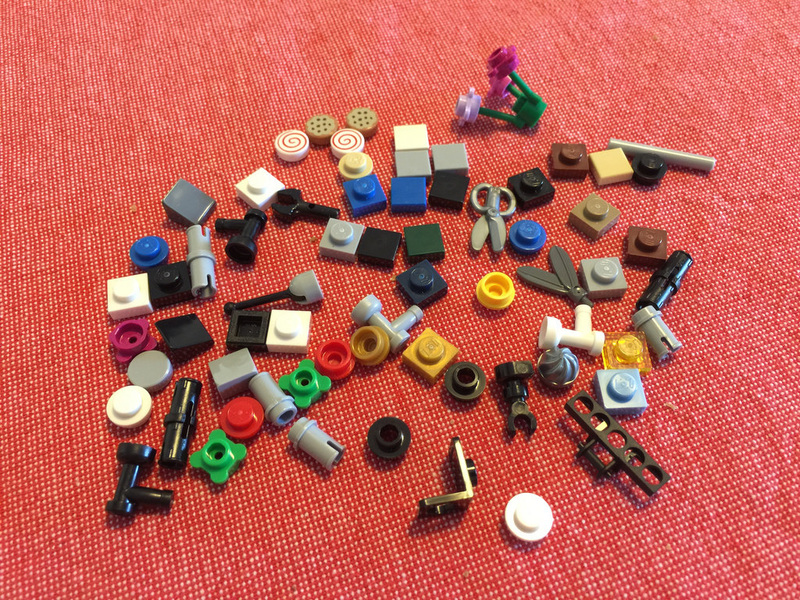 The amount of spares in this set is pretty nuts. As you can see from the image below, you get plenty! More printed cookies and candy, a full flower bunch, taps, darts, scissors and heaps more. It’s incredible! I’m very happy. That’s it for the main set, let’s spend a little more time looking at the Flower Cart polybag. For a promotional polybag, this is pretty great. It comes with 71 parts and a minifig, which I think is the biggest polybag LEGO has done. There isn’t anything unique in the set, but some cool stuff nonetheless. A shovel, broom, bucket, wagon wheels, and 5 bunches of flowers! One is considered a spare, but it’s still good value. Like I mentioned in last week’s post, there’s also a barrel of cookies. The minifigure is really nice. With overalls printed back and front, he looks great. It’s a pretty simple build that comes together quite quickly. 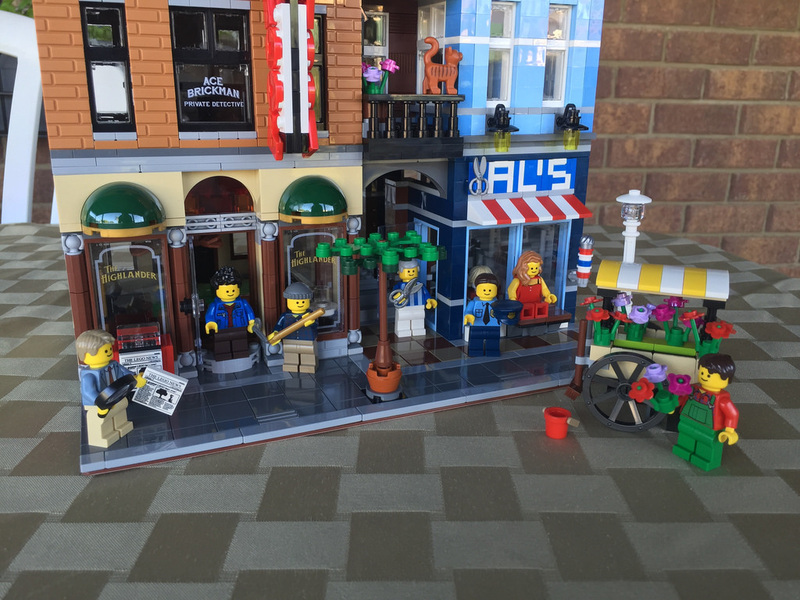 It looks clean, and is a fantastic addition to the streetscape of the Detective’s Office, even though it’s a separate set. I’m not sure how the little guy is supposed to move the comparatively large cart, but that’s a discussion for another time. Well, that’s it for definitely the biggest review I’ve ever done! It’s been a blast writing this one and remembering everything I noticed in the build. 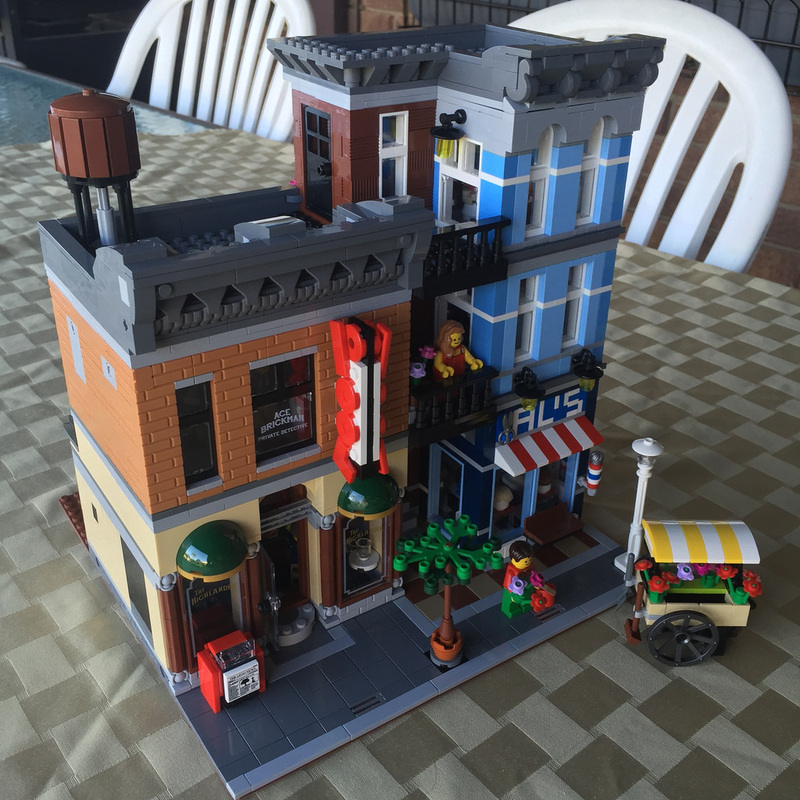 Modulars are a great theme to get into, so I’ll be getting another one as soon as I can! 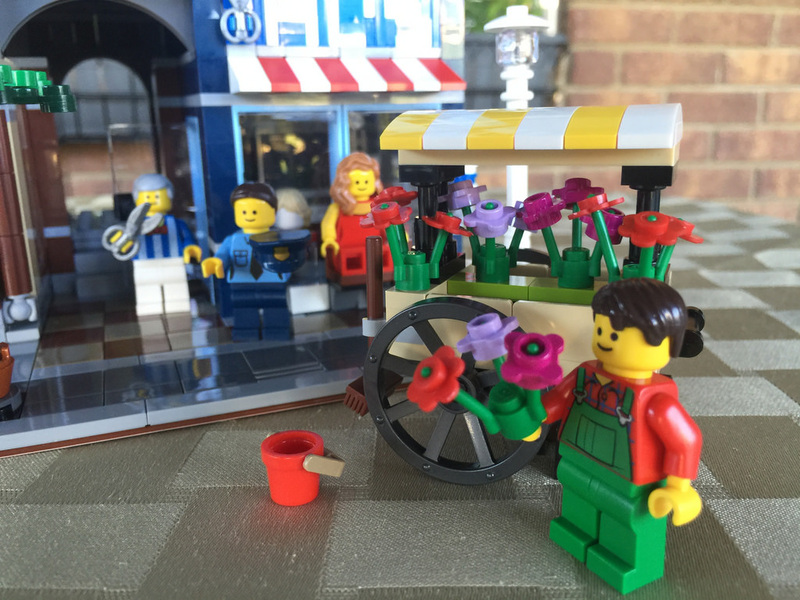 The Detective’s Office gets 9 out of 10 contraband cookies, with the Flower Cart getting 9 out of 10 flowers! Some of the best sets I’ve built. Let me know in the comments what you thought of the review, and the build if you have the sets! 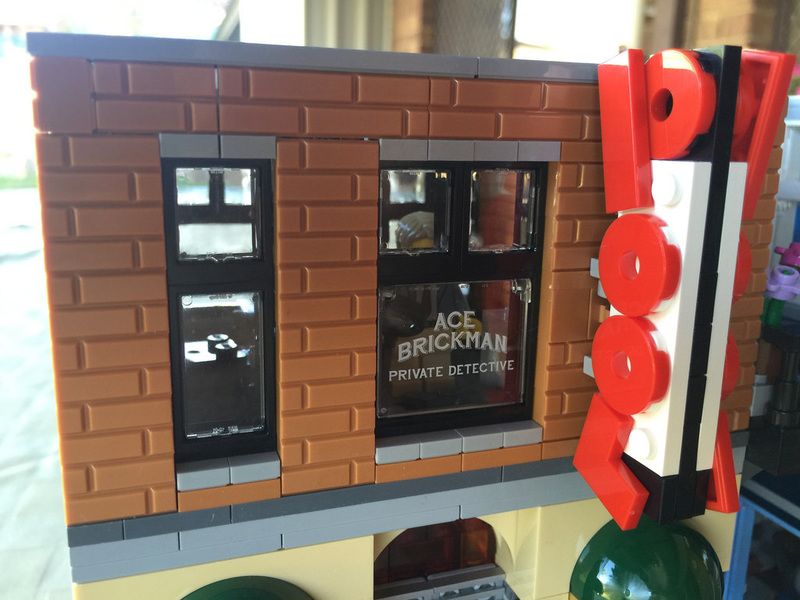 Don’t forget to like BricktasticBlog on Facebook! The next review will be 60083: Snowplough Truck. LiteUpBlocks: Let There Be Light! Excellent review. I have a box of this set in storage, waiting for a good reason to build it.